Doesn't everyone dream of spending a vacation in Italy? Once you start traveling around this enchanting country, you'll understand why. The food, architecture, culture, landscapes, and history all work together to make anywhere you visit in Italy a truly unforgettable experience. La dolce vita at its finest! 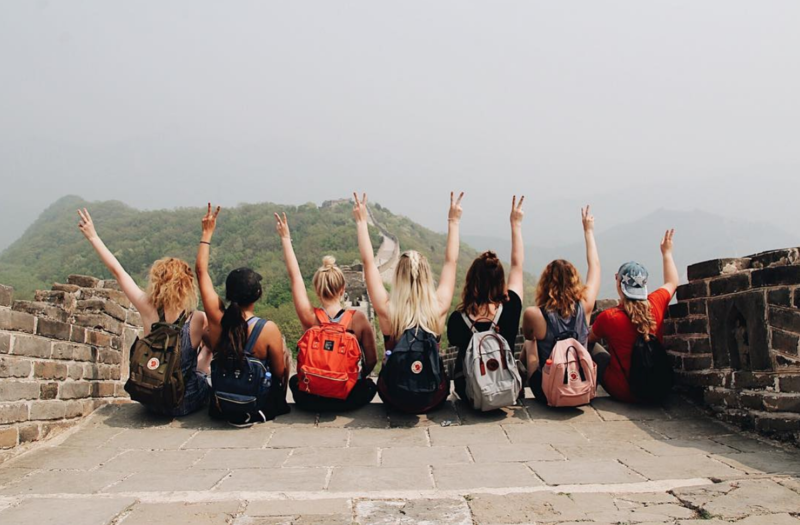 As a volunteer with International Language Programs, you'll have plenty of vacation time to explore places like Rome, Venice, Milan, or any of the other Italian cities that catch your fancy. 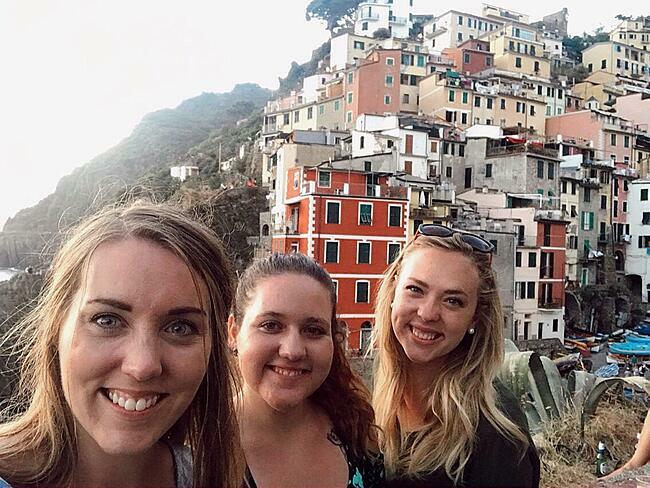 We know it's impossible to choose less than a few, but if you can, make sure Cinque Terre is on your list! These five little towns are the epitome of Italian coastal life in all of its colorful charm. Keep on reading for everything you need to know for planning this perfect getaway! Located along the coast of northwestern Italy, these five fishing villages on the Italian Riviera are actually part of a National Park. Listed from north to south they are Monterosso, Vernazza, Corniglia, Manarola, and Riomaggiore. 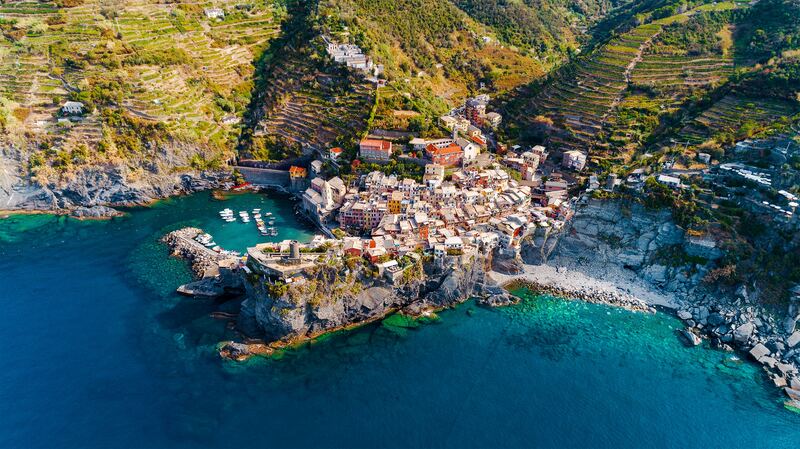 Thanks to Instagram and travel blogs, Cinque Terre has become a very popular tourist destination in the past decade. During the summer, the tourists come in droves, making these tiny towns very crowded. Try visiting right before or after the summer months in order to miss some of the chaos. They each have a bit of their own flavor and personality, so here's some info to help you choose where you want to spend your time. Of the five, this village is the most touristy. But it is also the only one with easy access to a beach, so if that's on your list, Monterosso is a must. We recommend starting your day here before all of the tourists arrive so you can snag a beach chair. Oh, Vernazza. This village is just charming. There is a little harbor, with the prettiest boats chilling in the water. You'll walk past a lot of shops on your way from the train station to the harbor, so this is a great place for lunch and gelato. People watching and walking through the colorful neighborhoods above the city center are pastimes we encourage. It's an uphill climb to get to this village, making it the least touristy and most peaceful of the five. But the 365 steps are worth the green vineyards, gardens, and ocean views you'll see at the top. This is where the landscape starts to get really breathtaking. The tall, razored rocks jut straight out of the water, and many of the houses are balancing right along the edges of the cliffs. There are several stunning viewpoints here, so make sure you save enough time to do some walking. Ending your day in this village is foolproof. It's the perfect place to enjoy a light dinner and, of course, more gelato. The houses are especially vibrant here, and we think the wall above the inlet provides the best sunset views of anywhere in Cinque Terre! 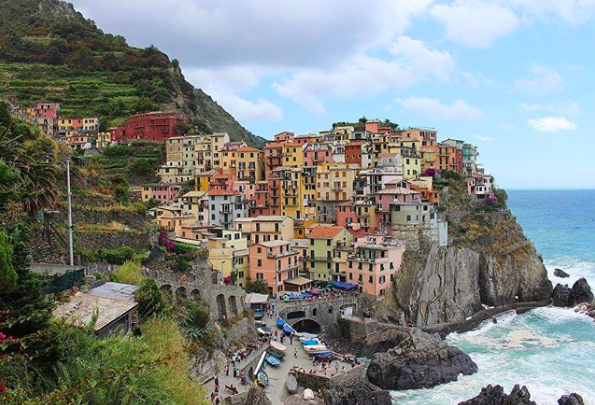 Fun fact: The best way to get to Cinque Terre is actually by train from any of the major Italian cities. Just another excuse to see some more of Italy (not that you need one)! Here are some rough estimates of time and cost when traveling from these cities to Cinque Terre. 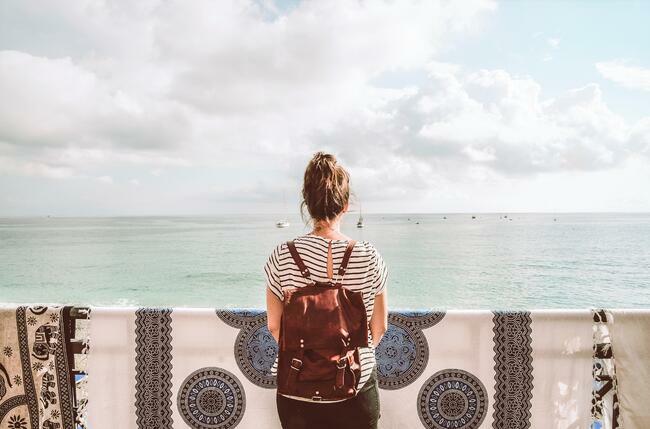 When you've figured out where you want to start your trip, purchase your ticket through this website! There isn't a simple way to get to and from the different towns on foot, but traveling between them on the train is actually really easy. 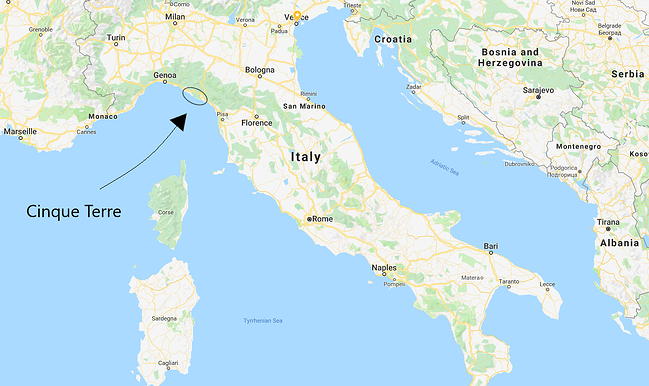 They are all connected via the La Spezia – Levanto railway, and getting from La Spezia all the way to the farthest village, Monterosso, only takes about 30 minutes. Just buy the tickets at any train station along the way. They are between 2-4 euros each. And don't be worried if a train is running behind schedule. This is Italy! Once you get inside these villages, everything is pretty much pedestrian zones only. They are all so tiny that you can easily walk from one side to the other in 10 minutes or less. Airbnbs are definitely the way to go when visiting Cinque Terre. Accommodations are not at all cheap within the five villages themselves, so if you're looking for something a little more wallet friendly, but still charming and convenient, we recommend staying in La Spezia. It's a short train ride from Riomaggiore and still right next to the water. This cute house would be a great for 3-5 guests! It has nothing but good reviews about the hosts and the place itself. Located just outside La Spezia, this spacious house looks very comfortable. With two bedrooms and six beds, this would be a great place to stay for larger groups! Those five star reviews give us all we need to know. If you're wanting to lay out and enjoy some of this warm and refreshing Mediterranean water, Monterosso is the only one of these villages with a beach. However, the shoreline is covered in rocks instead of sand, so make sure have water shoes with you. For a fee, you can rent an umbrella and chair for the day. There will be a lot of vendors walking up and down the beach, so this is also a great place to get some souvenirs. They are expecting you to bargain with them, so make sure you start with a pretty low offer. 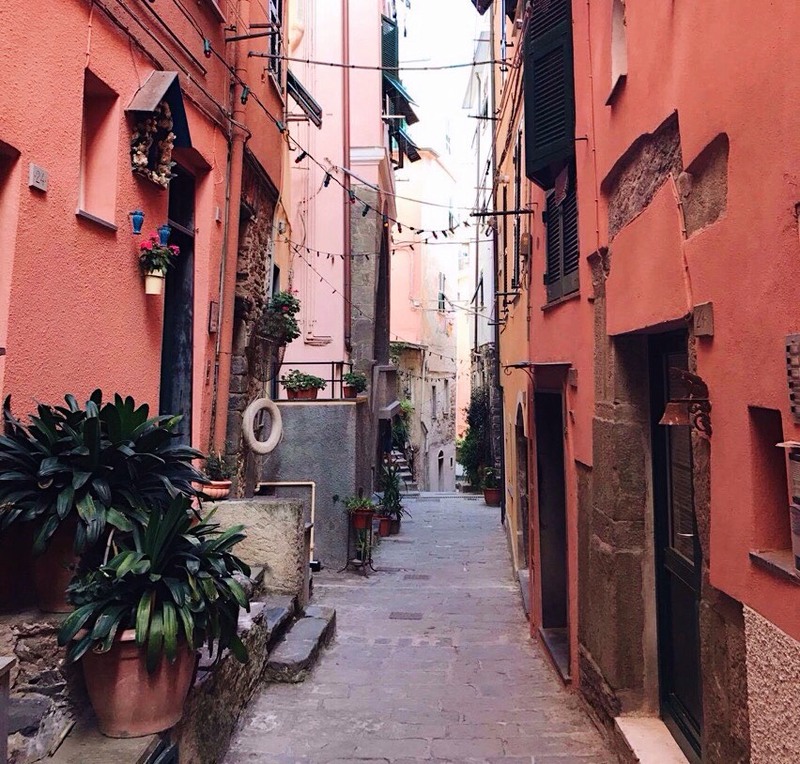 Our favorite place to do this is in Vernazza, but any of the villages will be full of bright, colorful surprises. Lots of stairs lead to breathtaking views. And if you get lost amid all the dead ends and narrow alleys? All the better! If you're looking for a good hike, you've found it. 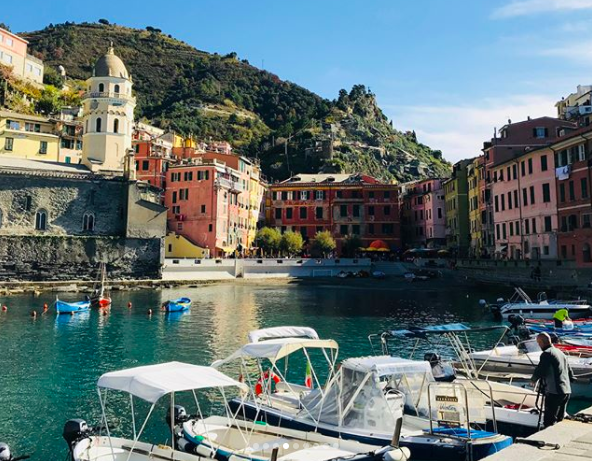 There used to be hikes connecting all of the villages, but now only the ones from Monterosso to Vernazza and from Vernazza to Corniglia are open. There's a rumor that the others will reopen in April 2021, so let's keep our fingers crossed. These hikes get very steep at some points, and are not for beginning hikers. Pack lots of water and bring a camera because the views are unlike any others you'll see! Heads up: Hiking these trails is not free. Purchase the card online here, and make sure you read up on all the added benefits! If you love boats and history lessons, make sure you do a boat tour. While it can get a little pricey, it will probably be the highlight of your trip. After all, many argue that the best way to see these towns is actually from the water. This company has the best reviews, and for 60 euros they will give you a 2.5 hour tour. You can even choose between a relaxing afternoon excursion and an evening sunset ride. We hate to break it to you, but you actually haven't had pesto until you've had it in Cinque Terre. It's not exactly like the kind we have in the USA...a bit creamier and lighter, and sometimes they will mix string beans and little potato chunks into your pasta as well. It might sound strange, but don't knock it til you try it. They are known for their pesto! Flat bread, usually with some kind of herbs added to the dough. 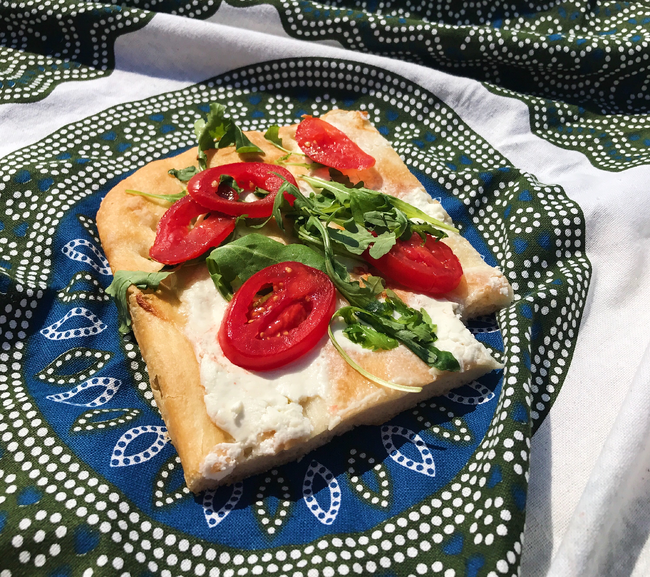 Our favorite has to be the kind smothered in pesto, but we're also fans of this one that was topped with soft cheese, tomatoes, and mixed greens as well. You really can't go wrong. It's perfect for lunch or even just a snack! Obviously this is one of the best places in Italy to get some good seafood. Our favorite way to order it? In a big, white paper cone. The shops that sell these are in every village, and we got ours in Riomaggiore. There is usually a large selection, so you can choose exactly what you want in your cone. Shrimp? Crab? Scallops? Deep fried? Buttered? Some of everything? Then squeeze a little lemon on top and...perfecto! While all of Italy is known for their gelato, there's just something special about eating it while sitting on a wall and watching the sun go down over the ocean. 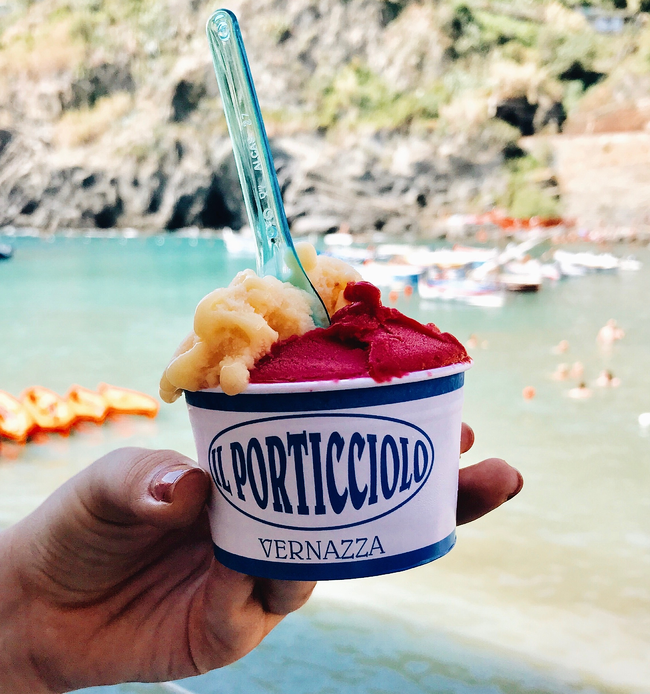 Since gelato is one of the cheaper food items available in Cinque Terre, we absolutely support (and encourage) making it a significant part of every meal during your stay. We hear the honey flavor is especially divine. Do not be one of those tourists who brings rolling luggage. If you do bring it, you'll end up carrying it because the stairs and cobblestones in Cinque Terre are not luggage friendly at all. We definitely recommend bringing only a backpack! Not sure how to fit everything you'll need in one? Check out this post for all our tips! Using your debit or credit card is not really an option in Cinque Terre. Expect to pay for everything in euros. But heads up, the ATM fees are CRAZY high in these villages, so if there is a way you can withdraw some money before getting there, that is ideal. Interested in volunteering with ILP but have tons of questions?